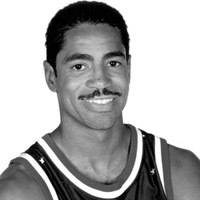 A native Peorian and 1982 graduate of Peoria High School, Johnson played for 18 seasons, from 1988-2006, for the internationally renowned Harlem Globetrotters. Curley inherited the role of dribbling wizard made famous by Marques Haynes and “Curly” Neal and became known as “The Worlds Greatest Dribbler”. Curley was a member of the team that participated in the enshrinement ceremony when the Globetrotters were inducted into the Naismith Basketball Hall of Fame in 2002. He was also part of the group that visited Pope John Paul II on November 29,2000 in Rome. As a Globetrotter Curley also has had the privledge of meeting Mother Theresa and South African President Nelson Mandella. After high school Curley starred at Loras College in Dubuque, Iowa where he became the first athelete to have his jersey retired. Curley was on student senate and the student representative to the college board of trustees as well as homecoming king. Curley did not just dribble through Dubuque he earned a degree in marketing at Loras. Nicknamed “Boo” by his father who was the first Black player to play for Bradley University and led them to a National title in 1957. Curley "Boo" has been inducted the Peoria Sports Hall of Fame, Peoria High Hall of Fame, African American Hall of Fame, Spoon River College Hall of Fame, and had the ultimate honor of having a street named after him on October 13, 2007. Curley will be inducted in the Illinois Basketball Hall of Fame May 4, 2019 and will recieve a Doctorate from hus Alma Mater Loras May 18th, 2019. Since retirement from the Globetrotters Curley has been on the speaking circuit recieving standing ovations nationally. He has his own basketball academy and camp and trains some of the top names in the NBA. Recently Curley portrayed a sports agent in the motion picture “Midrange” and starred in "Hood". Curley has been involved in many humanitarian causes such as the Boys and Girls Club,YMCA,Family Rescue,Big Brother Big Sister,The United Way,Special Olympics,Make A Wish Foundation,Tri County Urban League and the list goes on. • Converted nine out of nine consecutive 3 point baskets in the second half of a game in Bourg En Bresse, France with the last 3 pointer made from half court. • Debuted at Loras by hitting a 20 foot fall-away shot at the buzzer against rival University of Dubuque. • Coach Mike Jaskulski was quoted as saying that “Boo” is the finest ballhandler and dribbler he’s ever coached or seen play at Loras.